On this day in history, 1962, the chairman of the Joint Chiefs of Staff, General Lyman Lemnitzer, submitted a proposal to the Secretary of Defense, Robert McNamara, developed by the Joint Chiefs and the Department of Defense, outlining plans to commit various acts of terrorism on U.S. soil and then to frame the Cubans for it. 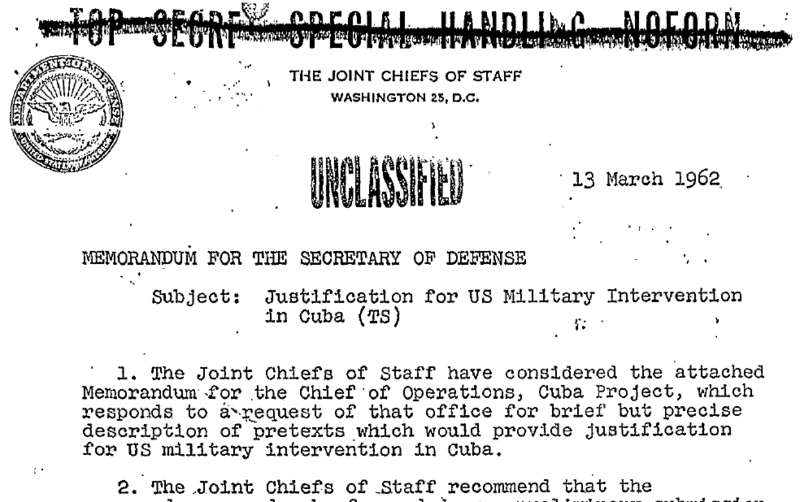 The end goal of “Operation Northwoods”, which this proposal was a key component of, was to create justification for going to war with Cuba. The suggested courses of action appended to Enclosure A are based on the premise that US military intervention will result from a period of heightened US-Cuban tensions which place the United States in the position of suffering justifiable grievances. World opinion and the United Nations forum should be favorably affected by developing the international image of the Cuban government as rash and irresponsible, and as an alarming and unpredictable threat to the peace of the Western Hemisphere. Having outlined their reasoning, they went on to suggest a variety of things the U.S. government could do to make the Cuban government look like they were actively attacking the United States. They would start by spreading rumors of Cuban descent against the U.S. and other Western countries. They’d then create a series of incidents in Guantanamo where they’d have “friendly” Cubans attack the U.S. base there, starting riots, lobbing bombs into the base, and other such acts of sabotage. These groups would be supplied and under the command of the U.S., empowered towards this end. Next, they’d execute a series of escalating operations against the U.S., framing Cuba for each one. We could develop a Communist Cuban terror campaign in the Miami area, in other Florida cities, and even in Washington [D.C.]. Probably the most notable of the suggestions in this proposal for those 9/11 conspiracy theorists out there was the plan to instigate a variety of civil aircraft hijacking operations with the intent of increasing the public’s fear of Cuba. Throughout the execution of this plan, “hijacking attempts against civil air and surface craft should appear to continue as harassing measures condone by the government of Cuba.” It should be noted, though, that the suggestions in the document itself mainly were encouraging simulating these hijackings with drones and fake passengers (each passenger with a made up back-story), rather than actually harming anyone. Another suggestion during this time was that the U.S. attack a member of the Organization of American States and then make it look like Cuba had done it, rather than the United States. Particularly, they felt Jamaica or Trinidad-Tobago would make good targets because they were members of the British Commonwealth, which would result in the ability to join up with the British in conquering Cuba (or if it was discovered the U.S. did it, the negative side effect would be potential war with the British and its allies…) Because of this potential risk, it was suggested that only extremely trustworthy personnel be involved in the project. After being removed as the Chairman of the Joint Chiefs of Staff, General Lemnitzer took up a position as the Supreme Allied Commander of NATO. A position which he held for the next six years, until he retired in 1969. During this same time, he was also made commander of the U.S. Forces in Europe, which was a particularly noteworthy appointment at the time. Somewhat ironically, given the incredible amount of corruption and abuse of power the Justification for U.S. Military Intervention in Cuba plan Lemnitzer helped forge demonstrated, President Ford, in 1975, hired Lemnitzer to take a position in the Commission on CIA Activities within the United States. The purpose of this commission was to determine if the CIA had violated any U.S. laws in the course of their duties and to see if certain CIA operatives had been involved in the assassination of President Kennedy. Guantanamo Bay Naval Base is the oldest foreign Naval Base held by the United States. The U.S. claims it is entitled to the 45 square miles the base takes up in Cuba because of a Cuban-American Treaty signed in 1903, which included stipulations to allow the U.S. to lease the land. The Cuban government today denies this lease is valid, but is unwilling to force the issue, which isn’t surprising given the relative military might of the U.S. compared to Cuba. Before Justification for U.S. Military Intervention in Cuba and various other proposals as a part of Operation Mongoose, which aimed to remove the communist government in Cuba, there was the Bay of Pigs invasion. This was a CIA instigated invasion of Cuba. The CIA trained various Cuban exiles and had them invade southern Cuba. Unfortunately for those Cuban exiles, the Cuban military was able to defeat them completely within three days. In 1961, the CIA teamed up with certain entities in the Chicago mafia to have Castro assassinated. They were obviously unsuccessful. All total, Operation Mongoose had a budget of around $50 million per year and, as Noam Chomsky stated, “won the prize for the largest operation of international terrorism in the world.” Even worse, during the Cuban Missile Crisis, although Kennedy supposedly officially paused Operation Mongoose in order to avoid triggering a nuclear war, there are still records indicating that operatives involved with the operation did not stop their actions during this time. While the Soviet Union placing nuclear missiles in Cuba may seem an idiotic thing to do, given the tensions at the time, it should be noted that the U.S. already had similar weapons deployed right next to the Soviet Union. As such, Khrushchev responded to U.S. concerns during the Cuban Missile Crisis with: “You are disturbed over Cuba. You say that this disturbs you because it is ninety-nine miles by sea from the coast of the United States of America. But… you have placed destructive missile weapons, which you call offensive, in Italy and Turkey, literally next to us… I therefore make this proposal: We are willing to remove from Cuba the means which you regard as offensive… Your representatives will make a declaration to the effect that the United States … will remove its analogous means from Turkey … and after that, persons entrusted by the United Nations Security Council could inspect on the spot the fulfillment of the pledges made.” So it’s possible getting the U.S. to remove its missiles so closely station to the Soviet Union may have been the real end goal of deploying nuclear weapons in Cuba, something they had to know the U.S. would not stand for. 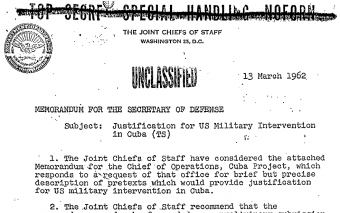 The Justification for U.S. Military Intervention in Cuba proposal was only made public in November of 1997 by the John F. Kennedy Assassination Records Review Board. All total, 1521 pages of previously classified documents from 1962-1964 were released by this board. Before becoming Secretary of Defense and close friend to President Kennedy, Robert McNamara was the President of Ford Motor Company. Hm. Sort of a reverse-deja vu, huh? yea reverse-deja vu, old idea put into practice not long ago.